Did you pre-order your iPhone 7 or iPhone 7 Plus from Rogers, Telus or Bell? Many who placed their pre-orders with the Big 3, are still waiting for their phones to arrive. Some have given up waiting and have taken advantage of Apple’s Reserve & Pick Up option to obtain a phone faster, when stock is available at retail stores (use iStockNow to check). We’ve been monitoring the chatter on iPhone 7 and iPhone 7 Plus pre-orders, but there doesn’t seem to be a lot of movement. However, some are starting to receive shipment notices. 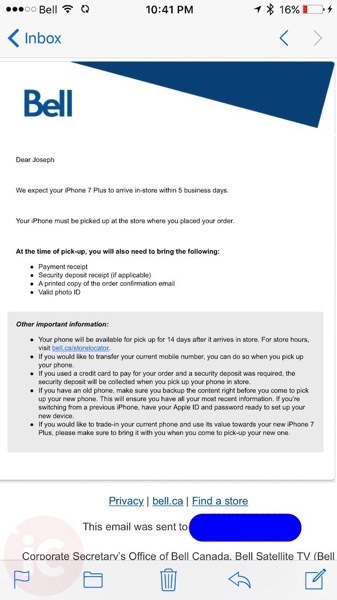 Some Bell users, such as iPhone in Canada reader Joseph, have been notified their iPhone 7 Plus is set to arrive within store in 5 business days. Others have commented Rogers stores, such as those in Oshawa have received iPhone 7 Plus in all sizes and colours (including Jet Black) this week. 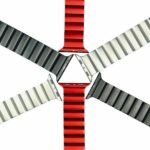 While consumers are able to obtain their orders, many with business accounts are being forced to wait at least another 2-4 weeks, according to Rogers. Jet Black iPhone 7 Plus remains the hard device to find; as of writing, Apple Stores do not have any in stock, nationwide. Apple.ca has the configuration shipping in 6-8 weeks. Have you received your iPhone 7 or iPhone 7 Plus pre-order from the Big 3 yet?